Yesterday's blog was just a bit downbeat. Last night I had a cough, a bad throat and I was worried that I was getting ill. Turned out that all I needed was a good night's sleep. I'm sorry but although I love the Spanish food, eating so late is big challenge to my sleep patterns. Last night I managed to wangle an early meal, didn't drink any wine, opened the window wide and for the first time since I've been in Spain, slept all night. This morning the cold had gone. 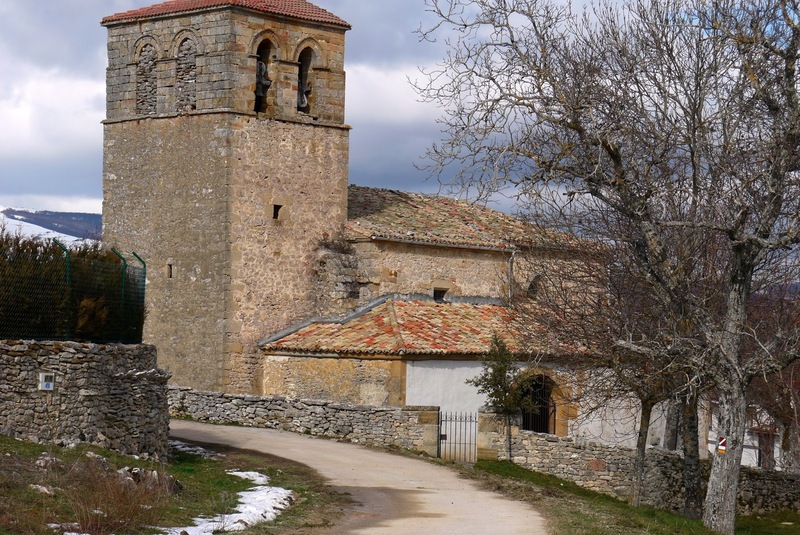 To avoid 20 kilometres of foot hammering along a busy road I got a taxi to Corconte, which is at the westerly end of the Ebro Reservoir. Confounding yesterday's weather forecast it was gloomy but definitely not raining. After two false starts I was on the right trail out of the village, heading up a hill along a snow filled lane. It took me 45 minutes to walk a kilometre and it was knackering. Crossing the main road at the top, across a huge open bowl, I could see same snow filled lane stretching into the distance. There had to be a plan B.
I decided to go south along the main road and cross country on a road which was yellow on my map - a sort of B road if you're English. About an hour later I was on this road, a concrete road which I was sharing with a herd of long horned cows. 30 minutes later I was following a tractor trail through deep snow which annoyingly went off in the wrong direction. 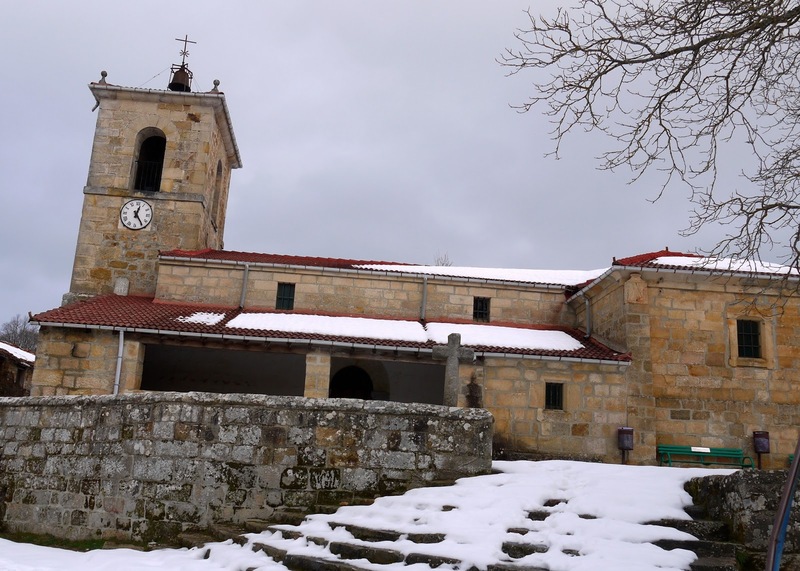 It was just me and the snow again and about 2 kilometres to Ahedo de las Pueblas which was where I hoped to pick up the GR1. At least there was concrete at the bottom of the snow - well that's what I thought until the snow gave way and dropped me into a couple of feet of icy water. I was soaked. Apart from getting wet I was actually enjoying myself. 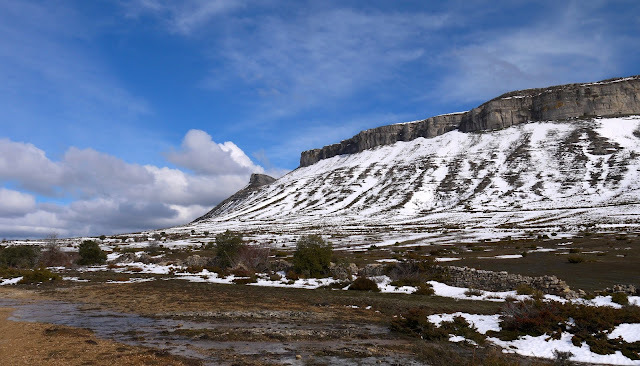 The scenery was bleak but very impressive particularly this strange layered limestone plateau which increasingly dominated the view ahead of me. At Ahedo de las Pueblas, a lovely limestone village, I had to decide whether to go on the snowy GR1 or head towards Pedrossa de Valderporres by road. 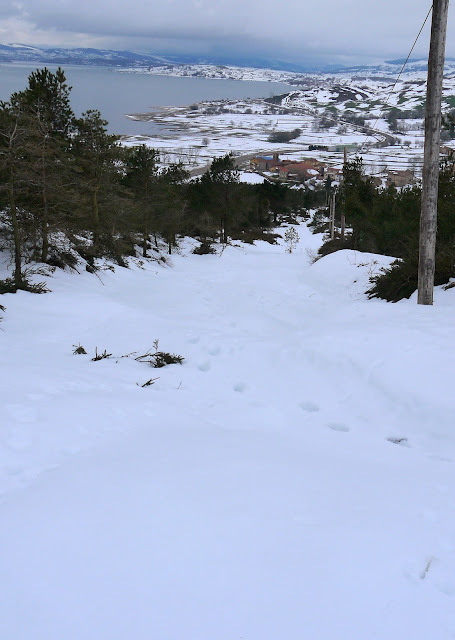 I stuck with the road which was clear but to atone for my unworthiness listened to three Spanish lessons on my Iphone. I stopped for a sandwich in a bar in Santaelices and watched a Spanish quiz show I had seen in lunch time bars two years ago on the E4. Involved spinning a huge wheel and spelling some words. Those Spanish hadn't worked, I still didn't understand it. 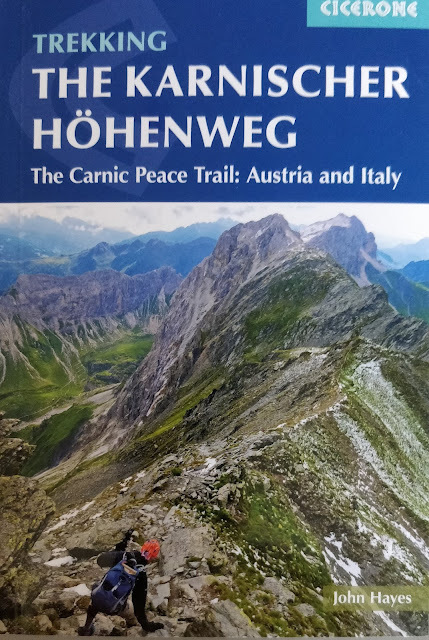 I decided to get back on the GR1 and climb up onto that limestone plateau. It turned out to be a good decision. To get up through the first set of cliffs you have to climb up along an old mule trail which thankfully was almost snow free. 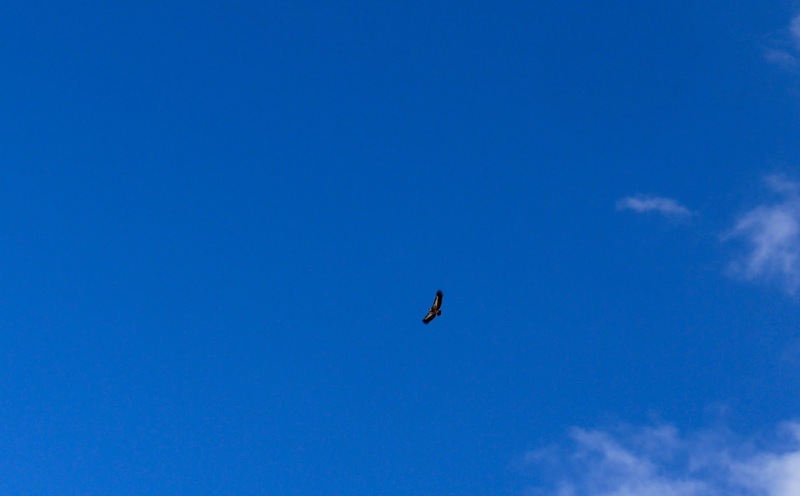 A couple of vultures must have been watching me and just before I got to the top dropped from the rock face and hovered about 10 metres above my head. I guess they were nesting and I thought I could hear some chicks although isn't it a bit early in the year for chicks? Passing through a gap in the rock face I found myself amidst ever green oaks with views across a plateau to another set of cliffs - the second layer on this limestone layer cake. There was water everywhere, a full thaw was taking place and at one point I had no choice but to wade across a stream and take my second icy soaking of day. Finally emerging from the trees and onto an open expanse the views were fantastic. To the east the huge cliffs; to the north a series of sharpe limestone escarpments with strata upended and disappearing at 45 degrees into the earth below; and to the west the vast upland snowy expanse of the countryside I had struggled through this morning. After four or five kilometres spent rounding the central limestone massif, at the village of Villamartin de Sotoscueva, the trail turns abruptly south and into yet another distinct phase of the walk, a long descent through a pretty but narrow gorge. The space at bottom of the gorge is shared between a path and stream. Initially the coexistence works and you can leap from one side of the stream to another but increasingly the stream, gathering momentum all the time, takes over. Time for a whole series of soakings but now through a fast flowing and slightly treacherous stream. Emerging from the gorge into the stunning little village of Quintanilla Valdebodres I'm tempted by the option of a shortcut to Nela but instead stick with trail. Initially I regret my decision, it's a road walk and my feet are sore, but it's not until you're on the bridge at Puenteday that you appreciate why the route has dragged you to the spot. 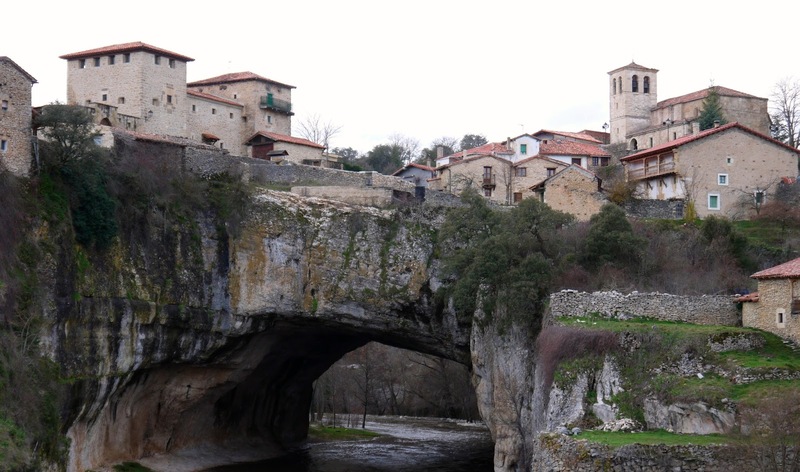 The hill top town is built on top of a natural arch which spans the River Engana, an amazing feature and more dramatic than its more famous cousin in the Ardeche. Finally arrived at Nela at about 6.30 and stayed at the lovely Casa Rurale run by Richard, from Holland, and Nicola, from England. We ate on Northern European time, and they put up with my ramblings all evening, a great end to a great day. Great John. The weather is becoming more convenient for walking even if you will have rain showers on next days. Anyway the sun will appear and dry your socks and your soul.